The holiday region Lienz Dolomites includes the area from the chief city Lienz to the Lavanttal valley. Lienz, the chief city of East Tyrol, is a small town which is very interesting from a cultural point of view. Bruck Castle with the museum and Tammerburg Castle are repeatedly venue for concerts and exhibitions. However, also the Phono Museum in the centre of the city attracts a range of visitors, as it is unique of its kind. Thanks to the combination of Mediterranean flair and the excellent restaurants offering Tyrolean delicacies, Lienz and its villages render this area a very popular holiday destination. The name “Lienz Dolomites” itself comprises a mistake, as the mountains do actually not belong to the formation of the Dolomites. However, as these mountains directly border on the Dolomites, this part of the Gailtal Alps is commonly known as Lienz Dolomites. Delight in natural beauty of the mountain range: in summer the Lienz Dolomites transform into a great hiking area, offering a splendid panoramic view, and in winter you can enjoy skiing on 37 km of ski slopes in the Lienzer Bergbahnen skiing area. Alpine pastures make up half of the municipal area of Ainet. Assling with its 2,000 inhabitants is above all popular for the wildlife park. Dölsach is located near the well-known Roman archeological site Agentum. At Leisach, an idyllic village close to Lienz, the Pustertal valley high road starts. Nikolsdorf, Lengberg, Nörsach and some single farms form the municipality of Nikolsdorf. 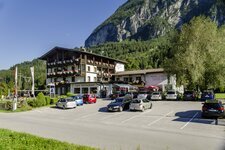 Oberlienz is idyllically located in the beautiful Lienz Dolomites. The municipality of Schlaiten is located on a terrace above the Iseltal valley. The sunny village of Thurn is located about 2 km above Lienz.